Peaches, blueberries, apples, cherries, raspberries and almost every summer vegetable start to make their appearance in July here in Michigan! Gather your favorite recipe, ingredients, jars, lids and rings and meet us for an evening of personal production canning every Thursday night in Lowell! July 11 production canning results for cherries, strawberries and raspberries! Three canners, Janet of Facility Kitchens and her daughter Madeleine and niece, Clare, in from Kansas City, were led by Diane Devereaux, The Canning Diva. Input: one 10# tub of pre-pitted tart cherries, from Heidi’s of Lowell, and one flat of raspberries, one flat of sweet cherries, and one flat of strawberries, from the Ada Farm market. The next personal production canning session is July 17 starting at 5:45pm until 10:15pm. We will work with berries and cherries again. Bring enough berries and other ingredients for your recipe and jars, lids and rings and can as much as you can in 4.5 hours. Reserve your place in the canning line at www.canningdiva.com or email janet@facilitykitchens.com. The session is $45.00 for the 4.5 hours. 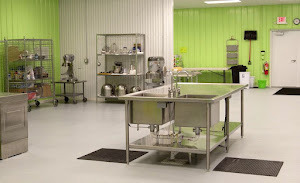 Facility Kitchens is a large commercial rental kitchen and provides the space and tools for you to can your produce. One canner worked with strawberries in a very short session making strawberry pie filling. Output: eight pints of strawberry pie filling. This may be it for strawberries this year. All-in-all; During this June, at Facility Kitchens’ personal canning sessions, nearly 18 flats of strawberries were processed into: rhubarb-strawberry pie filling, “Signature Strawberry Salsa”, jam, strawberry-lemon concentrate, strawberry pie filling, and bags of frozen strawberries. It is “On to Cherries!” for the next production canning session. Stay tuned and Join in!